Tiberius was born in 42 BC to parents Tiberius Claudius Nero and Livia Drusilla. 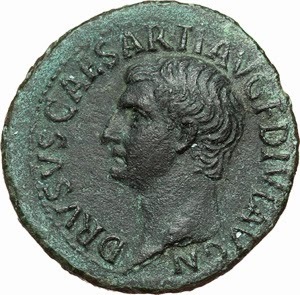 They also had another, younger son together, Nero Drusus before divorcing. After the divorce, Livia married Octavian, before he became the emperor, Augustus. As a young man, Tiberius pursued a life in the army, and for 32 years he fought in the service of Rome. He put down major rebellions and fought in Germany to secure the frontier. Family life at the apex of Roman power was convoluted and threaded with political marriage and divorce. Tiberius wed Vipsania, who bore him a son, Drusus the younger. At the behest of the emperor, Tiberius divorced Vipsania, to marry Agrippa’s widow, Julia, the daughter of Augustus. The marriage did not last, but before it ended, Tiberius was made a tribune. When Augustus started to contemplate who his successor would be, he brought forward his grandsons from Agrippa and Julia, Gaius and Lucius. They both died young (possibly with some help), and Augustus adopted Tiberius in 4 AD along with Augustus’ other grandson, Agrippa Postumus. Tiberius’ tribunican powers were also extended for ten more years. Augustus also forced him to adopt an heir of his own. He adopted his nephew, Germanicus. But, as with all things Roman, this plan was subject to change at the spin of a knife. Tiberius’ reign as emperor was a long one by Roman standards, approximately twenty-three years. It was during this reign that Jesus Christ began His ministry and was crucified under Pontius Pilate, in the Roman province of Judea. 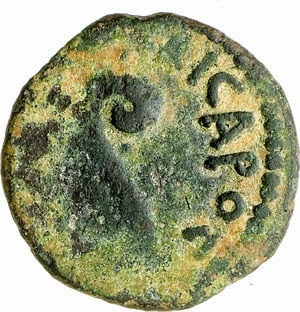 The numismatic legacy left by Tiberius included pieces made in provincial mints around the empire, in regions which spoke many languages, especially Greek. 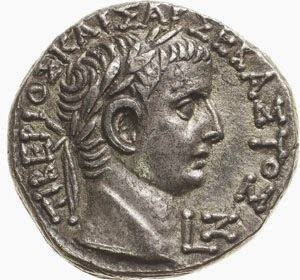 Many coins began to be issued with Greek legends to impress upon the dominated nations the grandeur and power of Rome. Tiberius in bronze, lower style. Tiberius in bronze, high style. 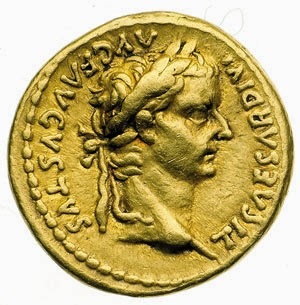 Many of the coins issued under Tiberius commemorated those who were important to him. An extraordinary number of issues were devoted to the deified Augustus, mainly in bronze. 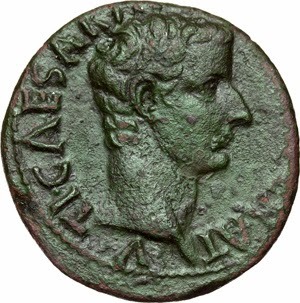 The portraits of Tiberius himself rarely equal in quality those of others featured on his coinage. 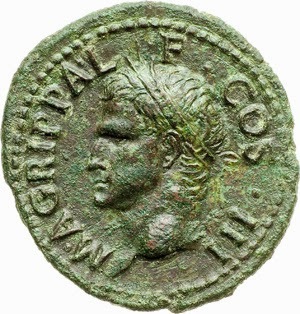 Others depicted on his coinage include bold portraits of Agrippa, whose strength and determination are captured remarkably. 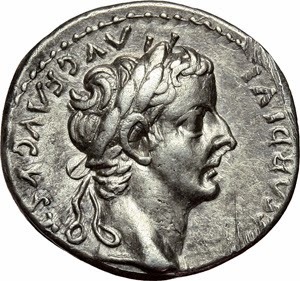 Augustus’ grandsons, Gaius and Lucius are celebrated on a coin that although not issued directly by Tiberius, was issued during the time of his reign. The twins are depicted in intertwined cornucopiae, facing each other. 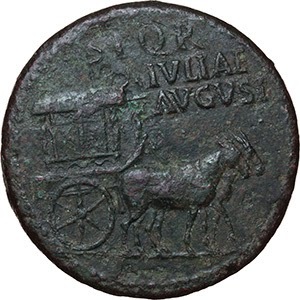 This is a masterpiece of Roman coinage, primarily due to the simplicity of its design and flowing curvature of its devices. 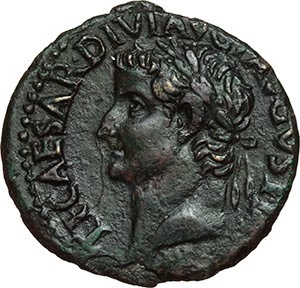 Some others commemorated on the coins of Tiberius include Julia, Livia and Drusus. 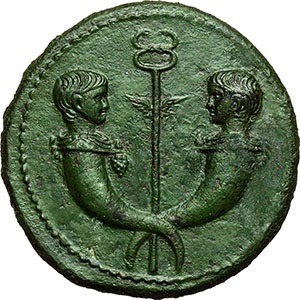 Gaius and Lucius, a masterpiece of Roman coinage. Silver issues of Tiberius include the famous “Tribute Penny” of the bible. 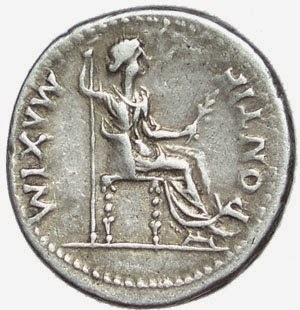 It is the denarius used to pay tax that Jesus referred to when saying “Render unto Caesar that which is Caesar’s.” Another group of issues made famous in the bible are the prutahs issued in Judea, often called "widow's mites", including those issued by the procurator, Pontius Pilate.